Problem rust stains on your house? Rust stains on your concrete, sidewalk or driveway? Rust on your boat? Need an effective rust remover? If you have rust stains, you will want to remove the existing stains before installing a rust stain preventer. To remove most stains without scrubbing, simply spray on, rinse and walk away! Rid ‘O Rust is safe for painted and un-painted surfaces, metal surfaces, stucco, concrete, stone, grout, and asphalt and will not etch concrete. Excellent product I will use it everyday. The best rust stain remover I ever used & I tried them all. 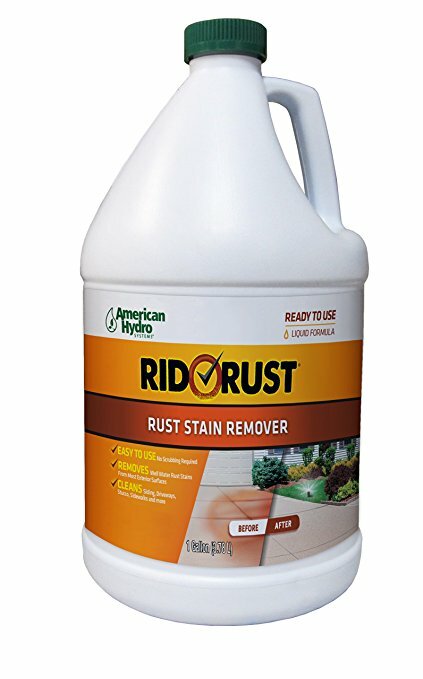 The best rust stain remover I ever used & I tried them all. This product can also take off 30 + year old stains. Easy to use.